Elinchrom has been renowned for its light shapers for a long time. Many photographers have been using the Rotalux line of softboxes even on other, more expensive strobe brands such as Profoto or Broncolor. The Rotalux system was also known for its quick and simple way of assembling the boxes. A couple of months ago, the Swiss brand announced a new line of light shaping tools: the Litemotiv. They might look very similar to the Rotalux system, but they are very different in many ways. Elinchrom was kind enough to lend me both sizes — a 120 centimeter softbox and a 190 centimeter softbox — and give them a try. Here are my impressions after a month of use. I have been using Elinchrom gear for about two to three years and always found that their build quality was great, but far from perfect. Compared to Profoto for example, I have found the materials used in their light shapers to be very light and not quite durable. Now, the Rotalux boxes I kept in my studio have never had any problem, but I cannot say the same for the ones I often take and use outdoors or on weddings. When I opened the bag containing the Litemotiv I was astonished. 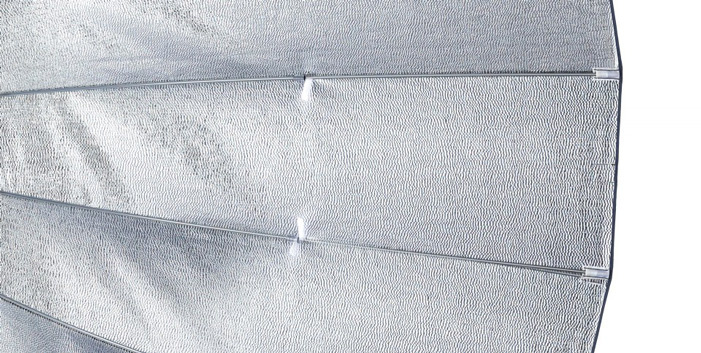 The material was totally different, very rugged, and felt great in the hands. Even the two diffusers feel strong and durable. The construction is very similar to the HR line from Profoto. I would be confident using these boxes with hot light, unlike the Rotalux. However, the excellent Rotalux assembling system is gone. 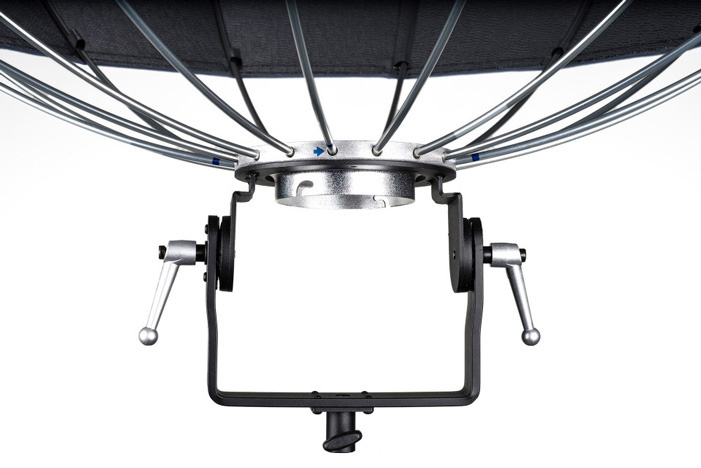 The new Litemotiv has to be assembled using the 16 rods, much like other brands of softboxes. It took me about 10 minutes the first time to mount the 190cm, and I was alone. Then the next time it took me under 5 minutes for the 190cm and under 2 minutes for the 120cm. So nothing to be concerned about. Sure it takes more time than the Rotalux line to assemble, but they are two different lines. While I love my Deep Octa for outdoor work, I like the result from the Litemotiv better. If time is a concern, for example at a wedding, the Litemotiv is not the light shaper of choice. If the final outcome is the most important thing, then the Litemotiv is a no brainer over the Rotalux. The speed ring is a single metal piece that has to be bought separately from the box. It is quite heavy but feels very solid and sturdy. I have always found Elinchrom light stand attachments to be quite flimsy because they were made of plastic most of the time. Well, this time I cannot say anything. It seems to be built like a tank! Note that because it is somewhat heavy, you better have a solid light stand, otherwise you might have troubles. 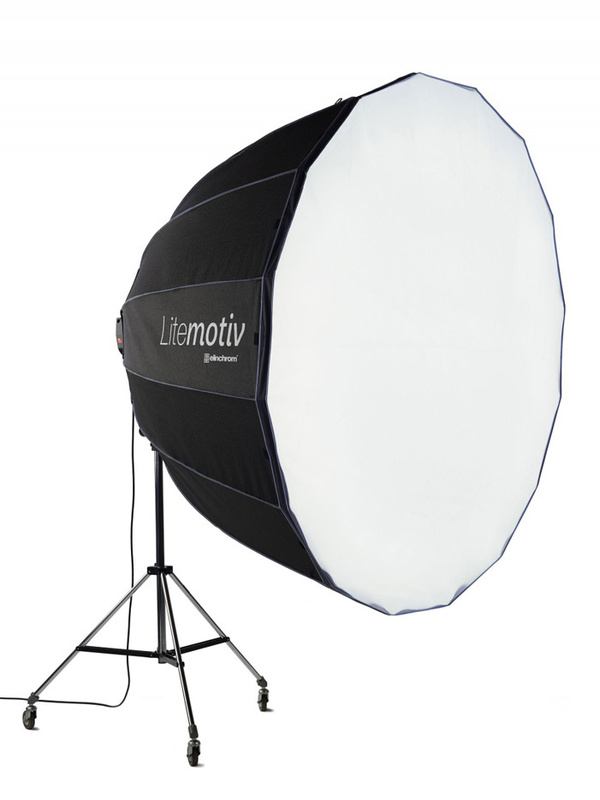 The Litemotiv are softboxes made of 16 sides. This construction allows you to get almost perfect circular catchlights. Also, because they are very deep, they offer that high-contrast look most Elinchrom users love with their deep octas. Just like other Elinchrom light shapers, you can use their deflectors that turn these big softboxes into huge beauty dishes. The 190cm Litemotiv is awesome for full-length shots. Because of its size you get a very consistent light from head to toe. Unlike the 190cm octa bank, it is quite contrasty, thanks to its deepness. The 120cm works fine for full-length shots but truly shines on three-quarter or even tighter portraits. I have even used it for beauty work and got a look close to a big beauty dish when using only the inner diffuser. Regarding their day-to-day use, let's be clear, these boxes are made for studio work or big productions — meaning you have a couple of assistants to help out. I tried taking them outdoors with no assistant, and that was a total fail. The boxes are too big and too heavy for on-location work and will only slow you down. The 120cm is priced at $509, and the 190cm is $1,299. You then have to add between $199 and $249 for the speed ring (pricing varies between mounts). That is clearly more than the Rotalux. However, the difference is more than justified. The construction is far superior, and I am sure the Litemotiv would last you years before you even had to change the interior cloth. Also if you shoot video, the boxes can support the heat of continuous light which is not the case of the Rotalux boxes. Put in comparison with other brands, they are also more than worth the price. Big softboxes with an almost round shape such as the Paras from Broncolor or the Giant Parabolic Reflectors from Profoto are worth a couple of grand. I know, they are not the same. You cannot zoom the heads, the assembling system differ, and the Litemotiv reviewed here have a direct mount. But still, for an almost round-shaped softbox, they are quite affordable. Because the speed ring supports the weight of the light shaper, you can mount a Quadra or ELB 400 head and not worry about it. I actually used the boxes most of the time with an ELB 400 to put less weight on the light stand. I would absolutely love seeing the same shapes but with an indirect mount of the strobe heads and zoomable possibility, much like a Para from Briese or Broncolor. A smaller version, between 70-90cm, would be awesome for beauty work. More easily transportable than a beauty dish, but still with a perfect round catchlight in the eyes. If I had to find another negative thing, it would be the assembly system. I so love the Rotalux line that I have become lazy. However, Elinchrom explained to me that because of the Litemotiv shape, it was not possible to do this any other way. Admittedly the "could be improved" points are minor things and more personal than anything else. If you have read my review of the Elinchrom ELC Pro HD, you know I do not write reviews to please brands. 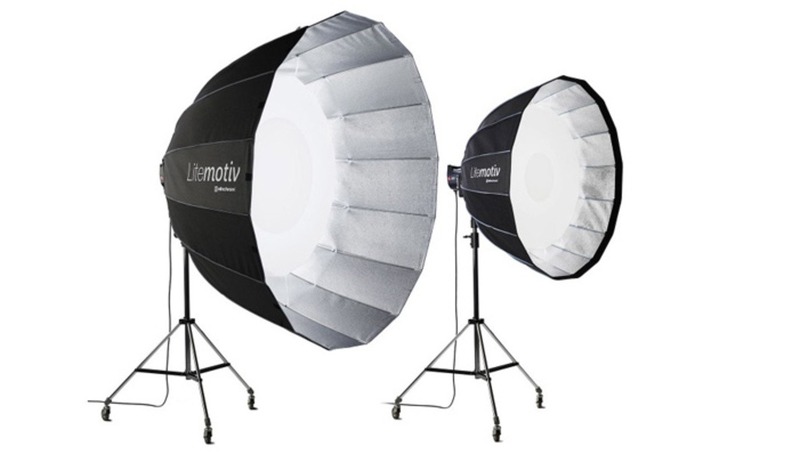 However, I must admit I wish I could keep the Litemotiv and not send them back to Elinchrom. They are awesome light shapers, and I already see the 120cm replacing my Rotalux 59" Indirect Octa. The even more recent Indirect Litemotiv line seems to be as good as the direct Litemotiv reviewed here. Seeing such quality products with awesome build quality makes me wonder what Elinchrom has planned for the rest of this year and the next. I think the Westcott Zeppelin system can compare and at a better price point. It would be more useful to compare the Elinchrom offering to the Westcott since they even share similar mounting systems. Westcott does offer a zoom arm now too. The Westcott Zeppelin, Hansel Gran and Elinchrom Litemotiv all look very similar… I must admit that I actually wonder if they shared the development of all three products. 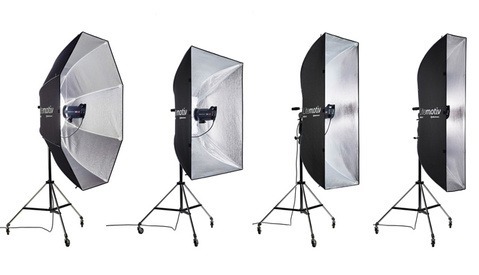 As for the price, they all cost pretty much the same, (Westcott $499, Elinchrom $509 and Hansel $519). So price would not be a deciding factor in the comparison in my opinion. The biggest difference seems to be the interior coat which is very glossy on Hensel and Westcott versions. Not sure what difference it makes though. You may want to add these products, from Aurora, to the list of similar light shapers. I neglected to mention that the black and white portrait is captivating. 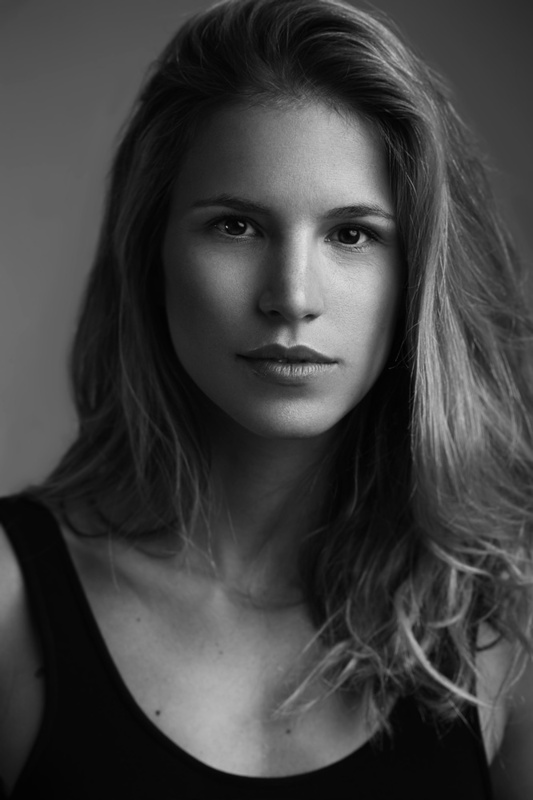 I'm a Deep Octa fan (using Profoto) and its clear that Elinchrom can still do modifiers well. That is a very nice photo of a very lovely model. Broncolor and that german brand with yellow edges must be happy. Briese or something? I believe that these are Rime Light rebrands, elenchrom has been rebranding instead of innovating as of late, the new Fresnel Spot is also a rebrand of a cheap chinese fresnel. I was very disappointed with the quality of the fabric not the quality of the light of the Litemotiv. The material feels very cheap compared to the Zeppelin. As much as I like Elinchrom, the Zeppelin beats it. Quentin what are thoughts on the differences between the larger Rotalux Deep Octa and the smaller litemotiv? Great review, would love to see a few more examples! To tell you the truth, I am really thinking about selling my Rotalux Indirect 150 to buy the Litemotiv 120. I find the catchlight of the 120 more natural due to the para shape, the clothes more rugged and the light stand attachment is far better (I hate the one of the Indirect 150). As for the "traditional" DO 100cm/39" , I am going to keep it. I like the look I get from the Litemotiv 120 better, despite being slightly softer. But the Rotalux DO 39" is far easier to travel with and work on location with when you cannot justify having an assistant. The assembly of the Broncolor Para is amazing compared to its competitors. It's a shame none of the other companies can produce something similar.